DogCast Radio is an Internet radio show for dog lovers. We seek to cover anything and everything dog related. We profile dog breeds, have interviews with dog owners, breeders and others connected with dogs. We have training tips from professional dog trainers, from the basic to the impressive party piece trick. For younger listeners we have Puppy Play Time, with items of interest for them, competitions and training tips too. We have news, Buddy's diary, website reviews and more. 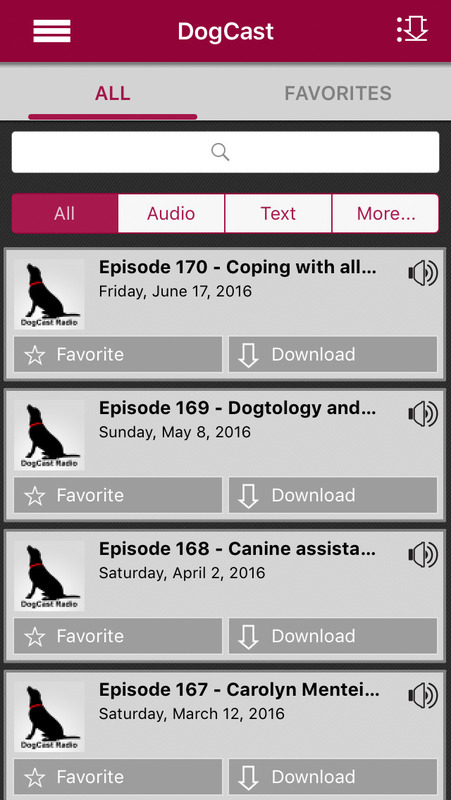 This is the most convenient and reliable way to access DogCast Radio on your iPhone, iPad or iPod Touch. You're always connected to the latest episode. Instant access, just touch and play! As an added bonus, you get bonus stuff! The App has been re-designed from the ground up and it's OH SOOOO much better looking with much easier functionality and accessibility! Here are some of the super star updates! - Car mode! Rotate your phone to display larger playback controls. - The main menu and playback settings are now accessible via a slide out from the upper left corner button. - Improved access to episode sorting features and the episode Star and Download options. - Improved display of episodes, artwork, and post file type. - Show contact features can now be accessed via the main menu or the upper right corner while viewing an episode. - Its just prettier… who doesn't want pretty? Please provide any bug reports via the troubleshooting button found under contact via the main menu. We hope you love the spiffy new look and features! Law of Attraction Tips – Attract Success Now! The Roadhouse - the finest blues you’ve never heard.